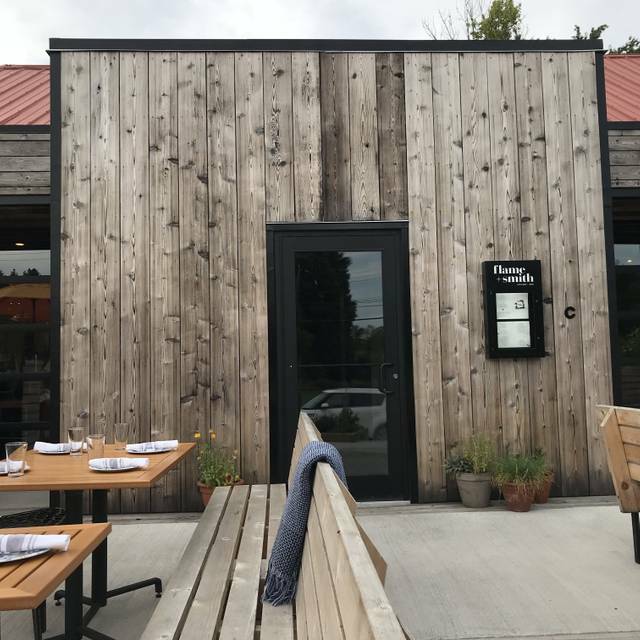 Flame + Smith is a sustainably minded restaurant that embraces the exciting art of woodfire cooking and the supporting community that surrounds it. Rodney was working behind the bar where we sat for dinner and he made our night. Such a great time speaking with him throughout our dinner. We can’t wait to go back! This was our first visit to Flame and Smith. The staff were very attentive and friendly. The atmosphere is lovely as well. The food was very good as well. We would definitely recommend this restaurant and plan to visit it again in the future. Beautiful space, yummy food, service was excellent. Great spot with good food and great service. Wonderful for a date night or special occasions. Wonderful foodie and ambience experience. Love the exposed roof grid, open kitchen and friendly, efficient service. You must go! The food was wonderful. Flavors of split pea falafels just spicy enough and I think they made their own pitas. The tzaziki sauce and roasted baba ganoush were yummy. Very attentive service. Interesting seeing the open flame cooking. We went there for Countylious April 2019, we where greeted by the owner (I think) who sat us right away. The atmosphere was very hipster, seemed posh and loud. I will say that the dim lightening was nice, there wasn't a lot of seating for more then 4 people, we sat at a small table for two which was very close to another table. The sever was okay, she spent more time talking up my partner than acknowledging me, almost missing my drink order completely. We had other severs clear our plates, as we finished each course. She may have been having a rough evening. The food....well, thank goodness for a pre fixed price because the quantity was small for a regular menu item. I wasn't impressed and my partner ask me if we should make a stop at McDonald's because he was still hungry after spending close to $150 for a three course meal (which felt more like appetizers) and two drinks. However he loved the cheesecake! My strawberry sorbet tasted like tart jello, wasn't a good way to end meal. I can now say I've been to Flame & Smith, unfortunately I won't be back. The OpenTable app was really easy to use for booking our table, I will be using that again. A lovely meal! Countylicious special menu was great. I had lunch here with my two sisters and our mom for her birthday. We were here from about 1:30-3 and shared a variety of dishes. I'd highly recommend ordering with the intention to share and getting a bottle to split from their excellent wine list. We came during the slower spring season and enjoyed the quiet atmosphere and large booth table. Food was good but with the order of steak you get potatoes and no vegetables unless you pay extra. There was no complimentary bread while you wait for your food. Wine was only 5 oz serving for about min $15. Overall good but a little extra would go a long way. Like comp bread. Larger serving of wine. A better food presentation with a little extra. We did not order the burger but it looked way better than the steak. Overly salted food. We were told it’s because they use salted butter. They did remove the item from the bill which was nice. Open table had us seated at the bar. Unusual, as we thought we booked a table. The bartender/server/host was very nice, and did offer to seat us at a table, but we took the bar seats so as not to take a table away from someone else coming. We have eaten there before and will go back again. Everyone has an off day at one time or another. If you like your food cooked over an open wood flame, I've found no better spot in Ontario. Chapeau to the chef! Honorable mention goes to the design team, that has created a showcase for the kitchen in a cavernous yet intimate space blending modern simplicity and rustic charm. The staff are exceptionally lovely. Rodney is such a great person to chat with while he shucks away. 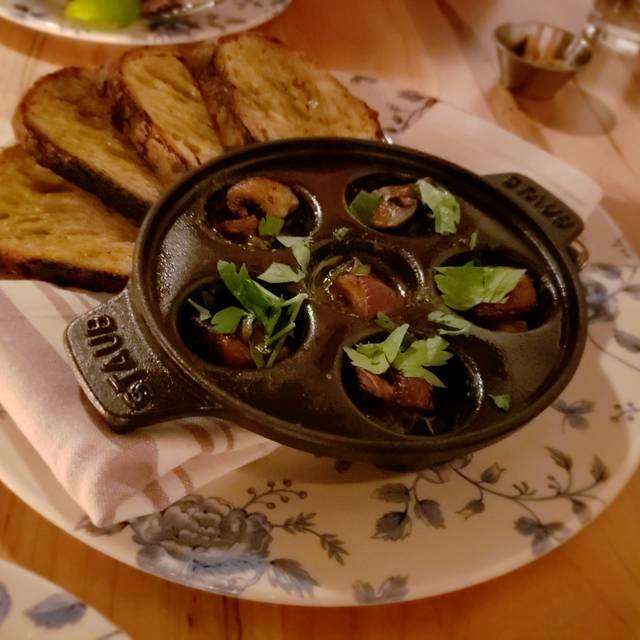 Our first visit to Flame and Smith was lovely. The staff were friendly and knowledgeable, the food was amazing, and the wine pairings were spot on every time. It is not inexpensive, but I still rate it well for "value" because it was entirely worth it. It was busy (on a Thursday evening! ), so it was not quiet, but the ambiance and "buzz" in the room was charming. Incredible, as always. Food, service, flavour, and ambiance. From the moment we entered the restaurant we were impressed by the ambiance and decor. It was relaxing yet classy and the large open kitchen and brick hearth were central to creating such an atmosphere. The servers were friendly helpful and familiar with the menu. We are vegetarians however despite the emphasis on fish, meat and fowl in the menu we were able to find dishes that suited us. The charred greens salad and vegetable tart were outstanding. 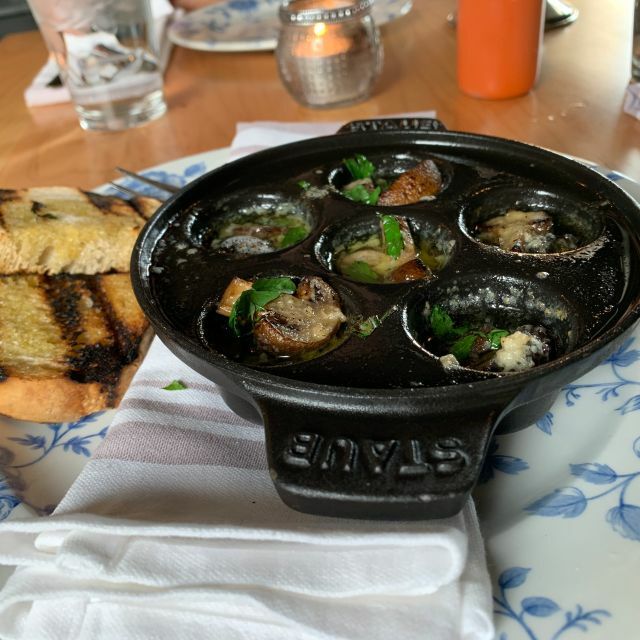 Having the dishes prepared on a flame resulted in a unique and delightful taste experience. 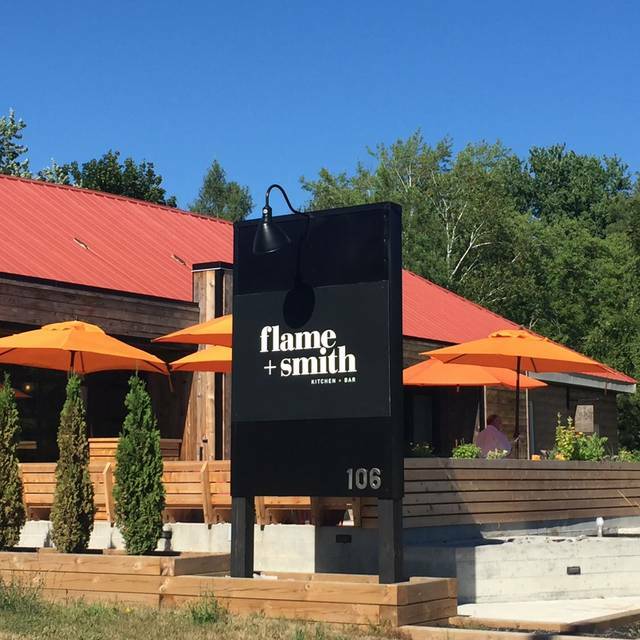 We will be returning and highly recommend Flame and Smith. Once again, we had a very pleasurable culinary and overall experience. Our meals were top notch, chicken on the grill and excellent dover sole. Wonderful ambience, excellent service, lovely background music and great comraderie amongst their very professional team/artisans. They are genuinely interested in their guests' experiences. I highly recommend Flame & Smith. We have made it a favourite of ours and always look forward to returning. My new favourite place to eat in Prince Edward County. I’ve already told a dozen people how fantastic this restaurant is! It’s obviously the brainchild of someone with vision and purpose! What a wonderful dining experience. Our server was very knowledge and personable. He really made our evening special. The food was delicious and perfectly prepared. A great place to go for a special night out! Fantastic food that is meticulously prepared. I would highly recommend this for a romantic dinner but fun with friends too. 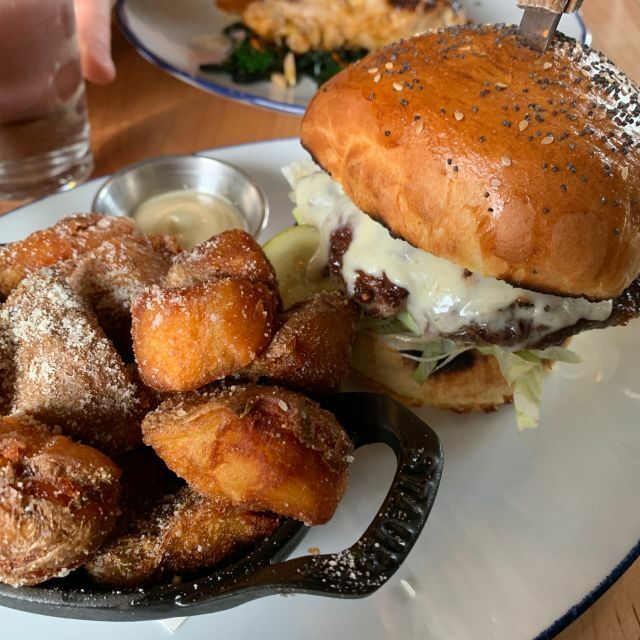 Enjoyed our meal very much - my husband does not eat onions and they provided his burger without the onion aioli, no problem at all. My vegetable tart was lovely! Food was presented hot and promptly. The ice cream with caramel popcorn - Lord Ha Mercy! That was good. Service was excellent and attentive. Great atmosphere as well. 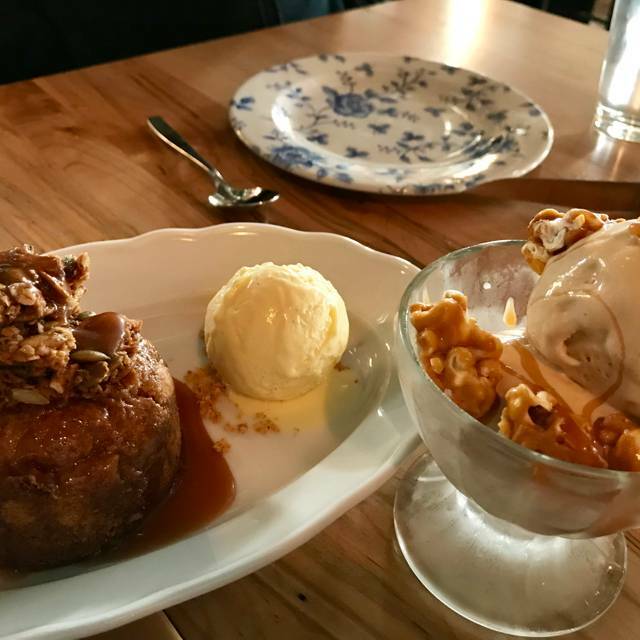 The first time my husband and I went to Flame and Smith, we had such a great experience that we knew we wanted to return. 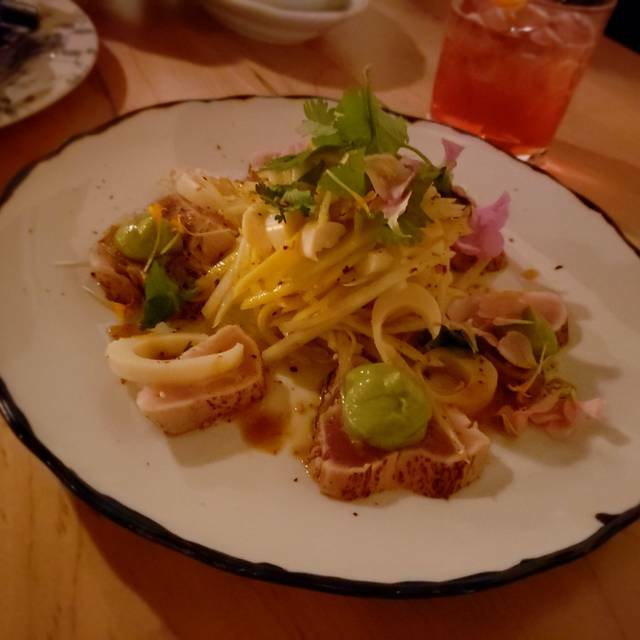 We came the Saturday following Valentine's Day for date night, and we had high expectations for our meal. We opted to go for the 4-course tasting menu (65 pp) and left the decision up to the chef. I'm not into terrine or liver mousse, and so they made sure not to include that in the tasting. From the bread basket and buttermilk calamari to the tuna crudo, from the pork platter to the dessert, every moment and taste was amazing. The service was terrific, and we will most definitely be back! Greeted at the the door immediately. Coats were checked in and coat check tickets were provided. All wait staff work together to ensure best possible service. Our table was wiped down between services. Food was incredibly fresh, unique and delicous. Second time dining here and the service was consistent both times. Would recommend this restaurant to anyone, even the pickiest most high maintenance friend. Attentive and friendly without any hint of attitude. Decor is a fusion of rustic and modern. Ambiance is dark and relaxed. Will definitely go back again. Tried the chef’s menu on second visit. I am a very picky eater, loved everything! 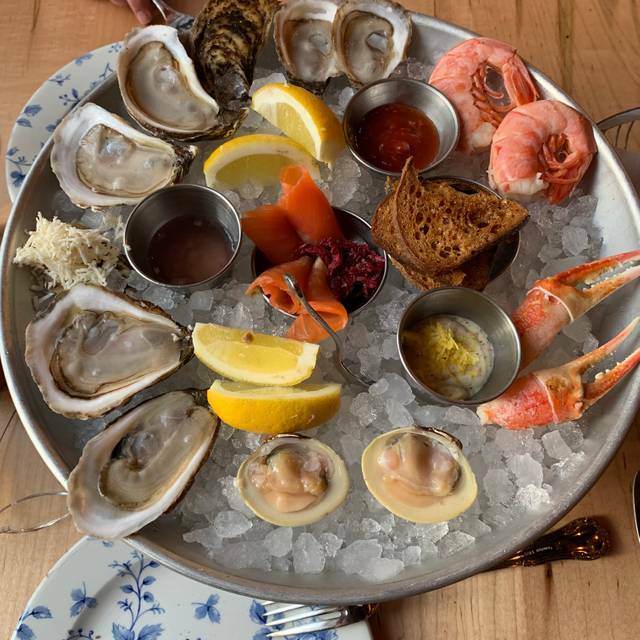 Loved the Prince Edward seafood platter. Steak was amazing! Excellent food. Do the chefs feature! So worth it and you get to try so many things from the menu. Amazing service also! Valentine’s Day dinner with my wife. Excellent food but drinks on the expensive side. $180 for two people. Two drinks each and we split an appetizer. Will definitely be back. We liked the food a lot. The service was good. We’d go back for sure! Fantastic food and a great wine list. Everything we ordered was perfect. Can't wait to go again. Another wonderful dining experience. 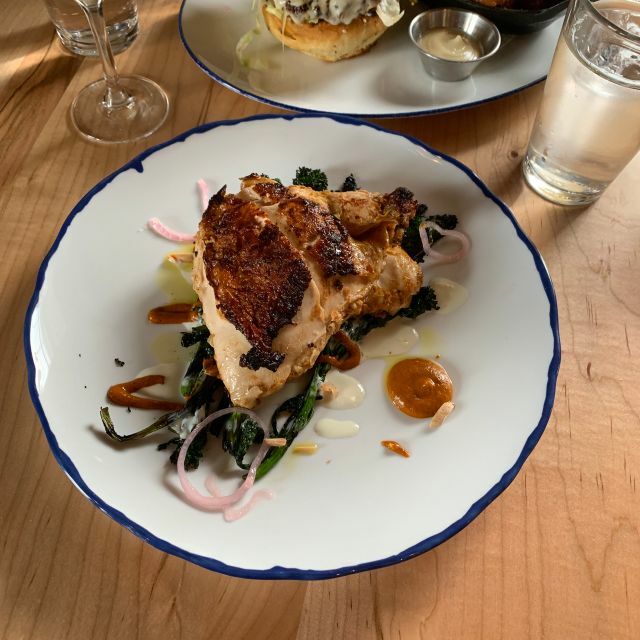 The chicken on the grill with incredible jus, welcoming atmosphere, and fabulous service make Flame and Smith a place we enjoy returning to. Always great and sincere interaction with all members of the team. Also, cappuccino was perfect. Fantastic ambiance, warm and friendly, amazing food! Excellent overall experience. The chef’s choice five-course meal is fantastic and great for sharing among four people. Staff are terrific. This is my fourth visit and each has been excellent from both a food and service perspective. Very good wine selection. Very highly recommended. Try the chef's table. It was lots of fun, full of surprises and great bites. Make sure you are hungry when you get there - portions are generous. Starting with the warm welcome from Evan and Jayme the minute we walked in the door to the visit from the owner/chef at the end of our evening, we couldn’t have chosen a better restaurant! The open flame method menu was creative and the food and service were outstanding. Great experience!